As the passing game continues to advance, defenses need to match personnel and scheme. One way they’ve been able to do so is through nickel, dime and quarter defenses. What are nickel, dime and quarter defenses? Nickel, Dime & Quarter defenses are defenses which include 5, 6 and sometimes 7 defensive backs. Defenses try to match speed with speed when offenses add more receivers to the game. Even though you might have thought this blog was going to be about money, it is actually all about defensive personnel! The Nickel look can be shown in two main variations: the 4-2-5 and the 3-3-5. Lets look at both. The other popular variation is a 3-3-5 front. Instead of exchanging a linebacker for a slot corner, this front exchanges a defensive linemen for a corner. The picture shows a 4-1-6 grouping (4 defensive linemen – 1 linebacker – 6 defensive backs). It is worth noting that this could also be run as a 3-2-6 but it is not as common. The most extreme of pass defensive packages is the Quarter. Our picture below shows 3 safeties and 4 corners but it could be 5 corners and 2 safeties. Defenses rarely use this look and it only comes up when obvious, deep passes are coming. Lastly, This look almost always comes with 3 defensive linemen and 1 linebacker. When Nickel, Dime and Quarter looks are being used, the defense is putting more personnel into stopping the pass. 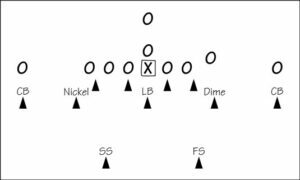 Nickel is very common and dime packages have frequent use at the NFL level as well. Remember, when you here these coin packages, there are more defensive backs on the field and the focus is on covering receivers down the field. 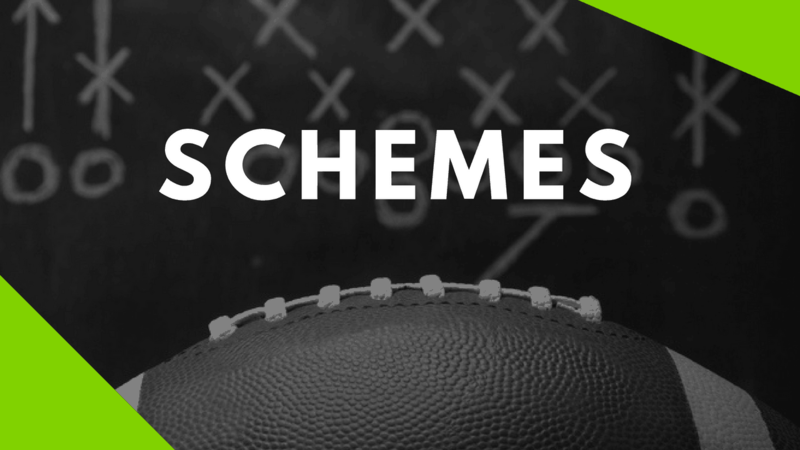 Do you have any comments or questions about the Nickel, Dime, or Quarter defensive groups? Let us know below!